This article is an adaptation of the notes of a presentation given at the Conference on “Doing Business in the Expanding European Union”, held on September 15, 2004 and organized by the British American Business Council of Los Angeles and the International Law Section of the State Bar of California. On May 1, 2004, the European Union grew from 15 Member States to 25. Its population grew from about 380 million people to more than 450 million. In 2007, when two more countries (Bulgaria and Romania) are scheduled to join the EU, the population will be close to half a billion. Clearly, the expansion from 15 to 25 Member States is likely to lead to a significant increase in the movement of goods, services and people, not only across the EU, but also between the EU and the United States. Unfortunately, past experience has taught us that such expansion also increases the number of cross-border disputes. In order to deal with this surge in intra-EU and transatlantic commercial disputes, both the EU and the US regard ADRs as a vital element in the attempt to provide fair and efficient dispute-resolution mechanisms. The Code of Conduct focuses on the internal workings of a mediation process and includes provisions to which individual mediators can voluntarily commit. It deals with the competence and appointment of mediators, their independence and impartiality, as well as the mediation agreement, the process, settlement and fees, and, finally, the internal confidentiality of mediation. In contrast, the proposed Draft Directive deals with issues such as ensuring the quality of mediation, enforcement of settlement agreements resulting from mediations, the external confidentiality of mediation statements, and the suspension of limitation periods, - all subjects dealing with the “external” aspects of mediation, i.e. how it relates to, and interacts with the world of judicial, arbitral and administrative adjudicatory systems. The proposed text of the Directive is the subject of some debate in the EU, receiving critical comments from various sources, including the legal community, chambers of commerce and special interest groups. Although planned for September, 2004, the Draft Directive will probably not become available until later in 2004 or in early 2005. In 1998, the United Nations Commission on International Trade Law, better known by its acronym, UNCITRAL, started work on a Model Law which formally came into being on November 19, 2002, when the General Assembly of the United Nations approved a Resolution endorsing what is called the “Model Law on International Commercial Conciliation”. In February of this year, the Journal of International Arbitration published my critical analysis of this Model Law. Although the Model Law clearly influenced the EU drafters of the Proposed Draft Directive  , in most respects they went their own way. Although to some of you the difference between arbitration and mediation may be obvious, for the benefit of those who are less familiar with this terminology, let me spend just a minute or so explaining what these processes have in common and how they differ: Unlike litigation that can be started by any party before a court of law, both arbitration and mediation are consensual, that is to say that you need an agreement between the parties that describes or refers to a procedure according to which one party can initiate such a process to resolve the dispute that has arisen between them. Such an agreement can be concluded after the dispute has arisen, but attempts to achieve this rarely succeed. The more common road to arbitration and mediation occurs by the agreement between the parties that bound them to each other in the first place. The principal difference between arbitration and mediation is that arbitration is held before one or three neutrals who sit as private judges and render an award that is binding, whereas mediation is held before one or sometimes two mediators who cannot bind the parties in any way, but simply facilitate negotiations between the parties in an attempt to reach a settlement. Thus, arbitration is more like litigation, but with some important differences: there is no jury, the rules of evidence are often suspended, there is usually less pre-trial discovery and the judgment, called the arbitral award, is usually final, so that there can be no appeal. In contrast to the arduous task of enforcing a judgment in another country, enforcement of an arbitral award is readily available pursuant to the so-called New York Convention of 1958  , which to date has been ratified by no less than 134 nations, including all Member States of the European Union and the United States. The New York Convention provides for the recognition and enforcement of foreign arbitral awards. For example, if I obtain an arbitral award from a panel of arbitrators in Paris against a party that has assets in California, I can take this award straight to the federal district court here in Los Angeles, and move directly for a judgment that will allow me to enforce the award against those assets. The added benefit of the relative ease of enforcement of arbitral awards is that voluntary compliance with the award may well be significantly higher than the voluntary compliance with court judgments. Clearly, international commercial arbitration presents substantial advantages over international commercial litigation. As a result, international arbitration has become the equivalent of going to court for domestic disputes. Unfortunately, however, in most cases international arbitration has the same disadvantages. As with domestic litigation, international commercial arbitration has evolved into a procedure that is expensive, lengthy, formal, and not uncommonly, extremely adversarial. For example, last year I was counsel in an international arbitration which we commenced on behalf of our client around August of 2002. The hearing took place in May of 2003. We finally received an award in the matter in March of 2004. The combined cost of the arbitration and both parties’ legal fees exceeded $2.5 million. Hardly an efficient way to resolve your dispute, isn’t it? The answer for international dispute resolution must therefore be found in mediation. Mediation is generally informal, much quicker, far less costly, and, since it is a voluntary process, gives the parties control over the outcome. International mediations of even the most complex cases do not have to be any longer than three or four days (which may be spread over a number of weeks or months if the parties need that extra time). The combined costs of the mediator and both sides’ legal fees and expenses, even with the most expensive mediators that you can imagine, do not have to be more than $100,000 to 200,000, and more likely much less than that. And imagine the management time you save, not to mention the emotional burden the executives often carry throughout the arbitration process. Finally, in many contractual situations, it is desirable that the parties resolve the dispute in an atmosphere that allows them to continue to have a relationship. This is often not possible in arbitration, because it tends to be so adversarial, but it is possible in mediation. There can be no question then that mediation is the preferred way to resolve transatlantic disputes. How do we get to mediate? The obvious next question is, how do we get to mediate? The best moment to decide on mediation is at the time that the business deal is written down into an agreement. As more and more lawyers realize, these days the dispute resolution clause in a commercial agreement is no longer “boilerplate”. In fact, the dispute resolution clause is a complicated provision and notoriously difficult to draft. It is a clause that requires careful analysis of what we want to achieve and an experienced hand to write it all down. If not, the parties risk ending up in court, litigating about the meaning of the dispute resolution clause instead of resolving the dispute. Without becoming too technical, allow me to mention some of the key elements of the dispute resolution clause that need to be considered if the parties want to include mediation. 1. Firstly, it should be realized that a mediation clause cannot stand on its own. Since it is a voluntary process in which both parties need to decide whether they can settle on the terms they have worked out in the mediation, we need to also provide for a process that deals with the dispute in case the mediation does not result in settlement. This next phase could be litigation, but since we are dealing here with a transatlantic agreement, the preferred next phase is arbitration. The dispute resolution clause will therefore provide first for mediation, and, if that is unsuccessful, for arbitration. We generally refer to this type of dispute resolution clause as a multi-step or multi-tiered dispute resolution clause. When you use such an institute to manage the dispute, it can first of all provide you with a set of rules that the drafter of the DR clause can declare applicable, with or without such variations as may be preferred by the parties. Furthermore, such an institute can provide you with a mechanism to resolve deadlock situations, for example if the parties cannot agree on the selection of a mediator, in which event the institute’s Rules (or in absence thereof, the DR clause in the contract) can provide that the chosen institute appoints the mediator instead. Finally, the institute manages the case, so that it oversees the time schedule, provides the necessary conference rooms, and generally assists the parties and their counsel by resolving whatever problems may arise along the way. Of course, in all fairness, there are many other institutes that can handle the administration and management of mediation and arbitration: they include the ICC (International Chamber of Commerce) , the ICDR (International Centre for Dispute Resolution), which is the international arm of the American Arbitration Association  , and the WIPO, or World Intellectual Property Organization  , just to mention a few. As both the case management fees and the nature and quality of the rules vary from institute to institute, it is best to consult with a lawyer who has some familiarity with the rules of each of these institutions to assist you in selecting the appropriate institute for the contract at hand. 3. Thirdly, once a dispute has arisen between parties, experience teaches us that it is not unusual for one party to try to avoid the mediation altogether and move straight to arbitration. Alternatively, one of the parties may try to abuse the mediation process in order to unduly delay the other party from resorting to the next phase, which we have seen is, in most international cases, arbitration. For this reason, the DR clause should establish a clear and enforceable obligation to try mediation before resorting to arbitration. This means that the mediation clause should set forth, or refer to, clear and objective procedures for (i) the selection of the mediator, (ii) an obligation to attend a minimum number of mediation sessions, (iii) the attendance by an executive who has full and complete settlement authority and (iv) a clear timetable establishing the beginning and the end of the mediation phase of the dispute resolution process. The DR clause should provide for sanctions in case of breach of any of these obligations, such as liquidated damages and/or recovery of costs and legal fees. Some multi-tiered dispute resolution clauses provide for the appointment of an arbitrator prior to or simultaneous with the appointment of a mediator. An advantage of this system is that the arbitrator can function as the authority to whom parties can turn in the event of the other side’s non-compliance with the obligations that apply during the mediation phase (provided, of course, that the DR clause expressly authorizes the arbitrator to exercise this function). Of course, there are many more issues that need to be considered, including the number of mediators (usually one), the place of mediation, the language in which the mediation is to be conducted, whether or not translators are needed, and which law applies to the mediation. Because of the importance of this statute, I have attached the text of Chapter 7 to these notes. You will see that, although these provisions were originally adopted in March of 1988, they are surprisingly complete when compared for example to the EU Draft Directive or the UNCITRAL Model Law. The existence of this statute makes California the preferred forum to hold an international mediation, irrespective of where the parties are located, where the dispute arose, or whether the dispute has any connection with California. Another important article is Article 9, which provides in substance that nothing relating to the mediation proceeding in California will subject any party to the jurisdiction of the courts of California. You can therefore safely decide to mediate in California and take advantage of the Act without risking that by doing so you would subject yourself to the jurisdiction of the California courts. The recent expansion of the European Union is likely to lead to a further, dramatic increase of the number of transatlantic disputes. The only efficient way to deal with them is by mediation or a similar alternative dispute resolution method, followed by arbitration if the mediation fails to lead to a settlement. Only when a good faith attempt to settle the dispute with the assistance of a skilled mediator has failed should the dispute proceed to arbitration. Preferably, a multi-tiered dispute resolution clause should be included at the time that the parties enter into the agreement that memorializes their business deal. The clause should be drafted by experienced, specialized attorneys and should appoint a specific institute to manage the dispute resolution process. The extremely favorable provisions contained in the California International Conciliation Act make California the ideal place in which to hold the transatlantic mediation. 1 For EU Statistics on population and other data, see http://europa.eu.int/comm/eurostat/newcronos/queen/display.do?screen=welcome&open=/∏uct=YES&depth=2〈uage=en. 5 UN Resolution 57/18, 52nd Plenary Meeting, Official Records of the General Assembly, A/RES/57/18, available at http://www.uncitral.org/stable/res5718-e.pdf. 6 Eric van Ginkel, The UNCITRAL Model Law on International Commercial Conciliation: A Critical Appraisal, 21 J. INT’L ARB. 1 (2004). See also http://www.mediate.com/globalbusiness/pg5.cfm. 7 Compare, for example Article 6 of the Proposed Draft Directive, dealing with confidentiality, with Article 10 of the Model Law. 8 In addition, international litigation is fraught with uncertainties about all sorts of other legal problems, of substantive law, forum shopping and other procedural complexities and evidentiary law, all of which can be remedied, or at least minimized by a well-crafted arbitration clause. 9 Convention on the Recognition and Enforcement of Arbitral Awards, done at New York, June 10, 1958, entered into force June 7, 1959, 330 UNTS 38 (1959); available at http://www.uncitral.org/english/texts/arbitration/NY-conv.htm. The reservations made by several states are available at http://interarb.com/nyc/reservations. The United States ratified the New York Convention on September 30, 1970, entry into force, December 29, 1970. 17 A concern was expressed in the UNCITRAL Working Group that drafted the Model Law that if the mediator turns arbitrator for the sole purpose of recording the settlement agreement in an arbitral award, the award may not be enforceable under the New York Convention because the arbitrator was not appointed at the time that there was a dispute, and therefore was not really an arbitrator for purposes of the New York Convention. This concern would be removed by appointing the arbitrator before the mediation commences. 19 I suggested an alternative text for the Model Law, supra note 4, 21 J. INT’L ARB. 1, 58-65 (2004), without considering the text of the California International Conciliation Act. Taking the latter into account, I would include into the Model Law a provision similar to Article 9 of the California Act. It is the policy of the State of California to encourage parties to an international commercial agreement or transaction which qualifies for arbitration or conciliation pursuant to Section 1297.13, to resolve disputes arising from such agreements or transactions through conciliation. The parties may select or permit an arbitral tribunal or other third party to select one or more persons to serve as the conciliator or conciliators who shall assist the parties in an independent and impartial manner in their attempt to reach an amicable settlement of their dispute. The conciliator or conciliators shall be guided by principles of objectivity, fairness, and justice, giving consideration to, among other things, the rights and obligations of the parties, the usages of the trade concerned and the circumstances surrounding the dispute, including any previous practices between the parties. The conciliator or conciliators may conduct the conciliation proceedings in such a manner as they consider appropriate, taking into account the circumstances of the case, the wishes of the parties, and the desirability of a speedy settlement of the dispute. Except as otherwise provided in this title, other provisions of this code, the Evidence Code, or the California Rules of Court, shall not apply to conciliation proceedings brought under this title. The parties may appear in person or be represented or assisted by any person of their choice. A person assisting or representing a party need not be a member of the legal profession or licensed to practice law in California. At any time during the proceedings, the conciliator or conciliators may prepare a draft conciliation settlement which may include the assessment and apportionment of costs between the parties, and send copies to the parties, specifying the time within which they must signify their approval. (a) Evidence of anything said or of any admission made in the course of the conciliation is not admissible in evidence, and disclosure of any such evidence shall not be compelled, in any civil action in which, pursuant to law, testimony may be compelled to be given. However, this subdivision does not limit the admissibility of evidence if all parties participating in conciliation consent to its disclosure. (b) In the event that any such evidence is offered in contravention of this section, the arbitration tribunal or the court shall make any order which it considers to be appropriate to deal with the matter, including, without limitation, orders restricting the introduction of evidence, or dismissing the case without prejudice. (c) Unless the document otherwise provides, no document prepared for the purpose of, or in the course of, or pursuant to, the conciliation, or any copy thereof, is admissible in evidence, and disclosure of any such document shall not be compelled, in any arbitration or civil action in which, pursuant to law, testimony may be compelled to be given. The agreement of the parties to submit a dispute to conciliation shall be deemed an agreement between or among those parties to stay all judicial or arbitral proceedings from the commencement of conciliation until the termination of conciliation proceedings. (b) the other party or parties agree to participate in the conciliation proceeding. (a) A written declaration of the conciliator or conciliators, after consultation with the parties, to the effect that further efforts at conciliation are no longer justified, on the date of the declaration. (b) A written declaration of the parties addressed to the conciliator or conciliators to the effect that the conciliation proceedings are terminated, on the date of the declaration. (c) The signing of a settlement agreement by all of the parties, on the date of the agreement. (a) A written declaration of a party to the other party and the conciliator or conciliators, if appointed, to the effect that the conciliation proceedings shall be terminated as to that particular party, on the date of the declaration. (b) The signing of a settlement agreement by some of the parties, on the date of the agreement. No person who has served as conciliator may be appointed as an arbitrator for, or take part in any arbitral or judicial proceedings in, the same dispute unless all parties manifest their consent to such participation or the rules adopted for conciliation or arbitration otherwise provide. By submitting to conciliation, no party shall be deemed to have waived any rights or remedies which that party would have had if conciliation had not been initiated, other than those set forth in any settlement agreement which results from the conciliation. If the conciliation succeeds in settling the dispute, and the result of the conciliation is reduced to writing and signed by the conciliator or conciliators and the parties or their representatives, the written agreement shall be treated as an arbitral award rendered by an arbitral tribunal duly constituted in and pursuant to the laws of this state, and shall have the same force and effect as a final award in arbitration. (a) A reasonable fee to be paid to the conciliator or conciliators. (b) The travel and other reasonable expenses of the conciliator or conciliators. (c) The travel and other reasonable expenses of witnesses requested by the conciliator or conciliators with the consent of the parties. (d) The cost of any expert advice requested by the conciliator or conciliators with the consent of the parties. (e) The cost of any court. These costs shall be borne equally by the parties unless the settlement agreement provides for a different apportionment. All other expenses incurred by a party shall be borne by that party. Neither the request for conciliation, the consent to participate in the conciliation proceedings, the participation in such proceedings, nor the entering into a conciliation agreement or settlement shall be deemed as consent to the jurisdiction of any court in this state in the event conciliation fails. Neither the conciliator or conciliators, the parties, nor their representatives shall be subject to service of process on any civil matter while they are present in this state for the purpose of arranging for or participating in conciliation pursuant to this title. No person who serves as a conciliator shall be held liable in an action for damages resulting from any act or omission in the performance of his or her role as a conciliator in any proceeding subject to this title. 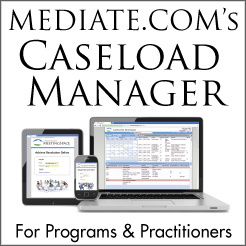 "Mediate.com has become a tremendous resource for mediators, their clients and anyone interested in conflict resolution. It is the go-to resource for conflict resolution. My clients frequently comment on the wealth of very useful information available on the site. The dedication and innovation of its creators guarantee it to be an influential resource to the world for decades to come."